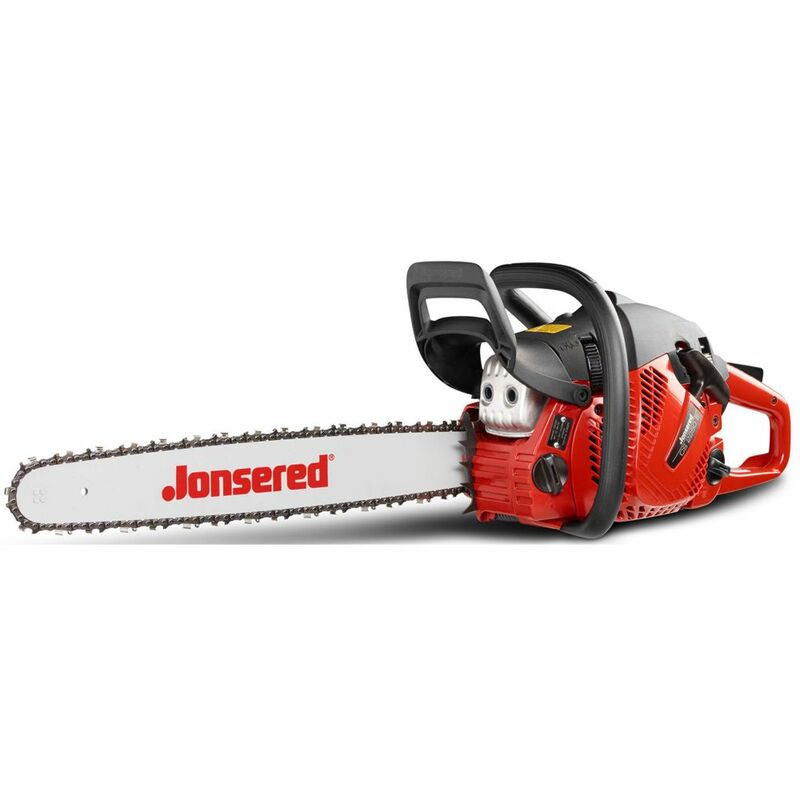 Ideal for part-time homeowner use, the Jonsered 2250 gas chainsaw is a great all-around saw that's perfect for felling trees or cutting large amounts of firewood. Our patented Clean Power engine technology is powerful and environmentally friendly, reducing harmful exhaust emissions up to 75% and increasing fuel efficiency up to 20%. Unique turbo intake air cleaning technology separates and removes up to 97% of sawdust and other dust particles from air before it reaches the air filter, providing optimal performance with less frequent filter cleaning. This reliable, durable chainsaw also features Jonsered's Anti Vibration technology for vibration dampening and our Spin Start system for reduced starter cord resistance. It's also equipped with a side-mounted chain tensioner for fast, easy chain tensioning. Powerful and reliable, the Blue Max Heavy Duty Gas Chainsaw stands up to the challenge of tough cutting jobs. This 18-inch chainsaw features an inertia-activated chain brake for safety, which stops rotation of the chain should kickback occur, while the automatic bar chain oil feed system keeps your chain lubricated for smooth performance. Easy and quick to adjust, this chainsaw boasts a pitch of 0.325 in., gauge of 0.058-inch and drive link of 72. The Blue Max 2-in-1 38cc High-Performance Gas Chainsaw features both 14-inch and 18-inch bar and chain lengths, giving you two chainsaws in one. This combo chainsaw is powered by a single-cylinder, 2-stroke engine that runs at 3400 RPM with no load and features a low-range kickback chain brake for added safety. An automatic bar chain oil feed system keeps your chain consistently lubricated, while the centre-balanced design and anti-vibration handle ensure maximum control with minimum fatigue. Additional features include the quick-start (CDI) ignition system and easy-access chain pro-tensioner for fast adjustments, ensuring hassle-free start-up and operation. The Poulan Pro PR4218 42cc 2-cycle gas chainsaw is ideal for medium-duty storm clean-up, tree felling and firewood cutting. The OxyPower engine provides more power, lower emission levels and lower fuel consumption. Fully featured with Super Clean Air Filter System, Automatic Oiler and Reduced Vibration Handles. The RM4214 Rebel chainsaw, our most compact gas powered chainsaw, packs the same punch as its big brothers, because even smaller trees and branches can be tough to tame. The Rebel's durable 42cc engine delivers steady power to the low-kickback 14-inch bar and chain, while the ergonomic design is balanced and maneuverable, which is ideal for hard-to-reach or tight areas. Even if it's only for occasional use, you'll enjoy handling this nimble and powerful machine. 50.2cc 18 inch Gas Chainsaw, CS2250 Ideal for part-time homeowner use, the Jonsered 2250 gas chainsaw is a great all-around saw that's perfect for felling trees or cutting large amounts of firewood. Our patented Clean Power engine technology is powerful and environmentally friendly, reducing harmful exhaust emissions up to 75% and increasing fuel efficiency up to 20%. Unique turbo intake air cleaning technology separates and removes up to 97% of sawdust and other dust particles from air before it reaches the air filter, providing optimal performance with less frequent filter cleaning. This reliable, durable chainsaw also features Jonsered's Anti Vibration technology for vibration dampening and our Spin Start system for reduced starter cord resistance. It's also equipped with a side-mounted chain tensioner for fast, easy chain tensioning. 50.2cc 18 inch Gas Chainsaw, CS2250 is rated 4.8 out of 5 by 4. Rated 5 out of 5 by Will 299 from Excellent Strong Saw Bought this cs 2250 Jonsered about a year ago. It is easy to start and reliable. Fast cutting and powerful. After Hurricane Michael we really put this saw to the test. Hour after hour of cutting big oaks. No problems. Great saw. Again,the best part is the reliable starting ,but this saw held it own against a bigger more expensive saw. I highly recommend it. Rated 4 out of 5 by Cedar Sacker from Dependable ...Easy to start I have had my saw for over a year. I have 2 Jonserds and 2 other saws. With the fuel pump the Jonserds start easy every time and run all day without heating up. They have a great power to weight ratio.